Canada and the United States have very different approaches to the phase-in of environmentally-friendly HFO-1234yf. This is most evident in regulations for its sale and import, and also in how each country treats the concept of recycling. The short version is that Canada has strict requirements, while the US has virtually none. For a little background, the phase-out of CFCs and HCFCs in both countries is consistent with worldwide efforts to eliminate substances known to deplete the ozone layer, and HFOs are a much safer (and more expensive) replacement. HFO-1234yf is going to be in a lot of new cars in 2019. Although both Canada and the US are phasing in environmentally-safe refrigerants like 1234yf, Canada has simply been more aggressive about regulating environmentally-friendly practices and safeguards, and from a much earlier date. Since 1987, Canada’s federal government has revised their regulations several times, and included strategic plans for early phase-out of ozone depleting refrigerants. Environmental Awareness Training Programs are also required for Canadian technicians in the refrigeration industry, and training covers reclamation, reuse and recycling; in comparison, the US currently has no comparable requirements on environmental education, training around reclamation, or recycling of refrigerants. One of the ways these differences manifest in the U.S. is in landfills, as old “recyclable” or disposable cylinders are thrown out. This is something that has been bothering me for a while. The containers are technically recyclable, but for a lot of shops, it’s not worth making the effort at roughly 25 cents of scrap value per cylinder. By comparison, Canada doesn’t permit anything but refillable containers, and they are valuable. The differences in recyclable/disposable containers for HFO-1234yf and refillable cylinders are in the quality, cost, and use. Once a refillable cylinder’s HFO is gone, the container is shipped back to the manufacturer to be filled again. This comes at some expense to both wholesaler and manufacturer, with core charge/deposits (roughly $80 CAD) on the containers. And of course consumers shoulder some of the cost of these protocols and regulations, too. 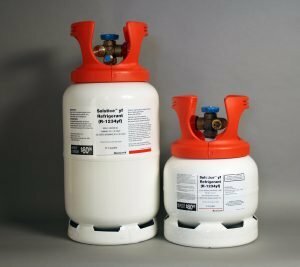 So why does Canada prohibit the import of any refrigerants in non-refillable containers? Part of the original reasoning behind this is that non-refillable containers pose a risk of leaks and corrosion…the regulations were originally written for HFCs and HCFCs, but they apply to HFOs as well, which is why you will see HFO-1234yf manufactured for the Canadian market in refillable containers only. The United States has no similar requirement for refillable containers, and this is why Honeywell and Chemours offer two different product lines for wholesalers. But Canada’s regulations have also protected its environment from scrap metal waste, and not just ozone depletion. Most U.S. dealerships and collision shops have a ‘scrap guy,’ and this person is probably able to make arrangements to pick up old containers before they hit the landfill. There are no regulations or monetary incentives for doing this, but I’d like to encourage my customers to make the effort if they can. While we probably don’t want to go full scale on restrictions the way Canada has, I can’t help but think it would be nice if fewer ‘disposable’ containers ended up in our landfills -they may be disposable, but they don’t break down, and they don’t recycle themselves. If you’re really interested in all of this and looking for a National resource on Canadian regulations for refrigerants, visit Refrigerant Management Canada. Or for an example of how each province handles their regulations, The Manitoba Ozone Protection Industry Association (MOPIA) offers a compliance guide, recently published in May 2018. The U.S. is typically not as fast to adopt or enforce environmental regulations compared with the EU or Canada, but it is possible that we may see similar requirements here in the future. If anyone has found a novel way to deal with the disposal and recycling of these cylinders, or good partnership with a recycling or scrap facility, I’d be interested to hear about it.